The 2018 Atlantic basin hurricane season came to an end on November 30. The season ended up slightly above normal with a total of 15 named storms, 8 hurricanes, 2 major hurricanes and an Accumulated Cyclone Energy (ACE) of 129. Final ACE values may change slightly in post-season reanalysis of tropical cyclone intensity by the National Hurricane Center. The 1981-2010 average values of these quantities are 12 named storms, 6 hurricanes, 3 major hurricanes and an ACE of 106. 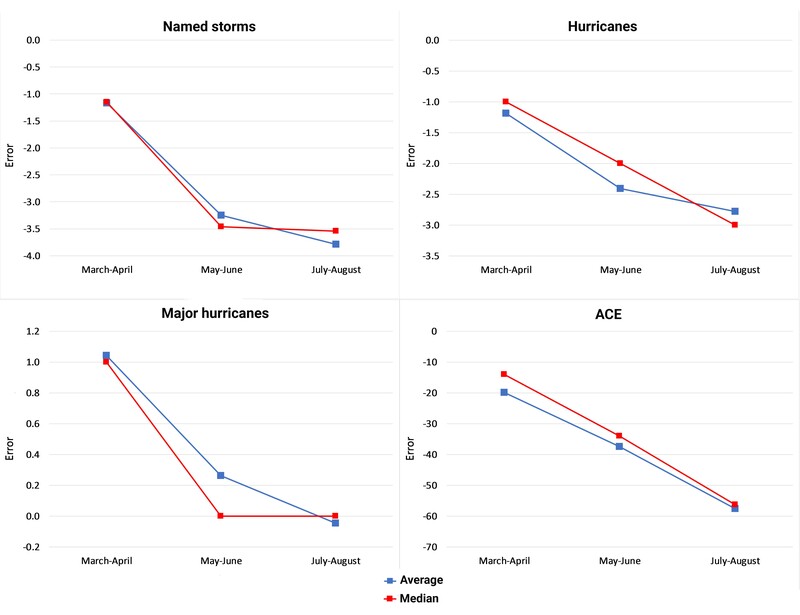 In general, Atlantic seasonal hurricane forecasts called for a slightly above-average Atlantic hurricane season in March/April, with agencies generally decreasing their forecasts in May/June and July/August. Unlike most seasons where the skill of the seasonal forecasts increases as the peak of the season approaches, this season’s early forecasts were more skillful than updates issued during July/August. This decrease in predicted storm activity was primarily due to anomalous cooling that took place in the tropical Atlantic. Despite anomalously cool tropical Atlantic conditions during the hurricane season and stronger than normal shear in the Caribbean, the Atlantic hurricane season was slightly above-normal, likely due to favorable conditions in the eastern tropical Atlantic and in the subtropical Atlantic. Warm neutral ENSO conditions prevailed during the season. The average values predicted by all groups issuing forecasts in March/April were 14 named storms, 7 hurricanes, 3 major hurricanes and an ACE of 109. These numbers decreased in May/June to 12 named storms, 6 hurricanes, 2 major hurricanes and an ACE of 92. The average prediction issued in July/August called for 11 named storms, 5 hurricanes, 2 major hurricanes and an ACE of 71. It should be noted that not all forecast groups issue predictions for all four tropical cyclone intensity metrics. In terms of Accumulated Cyclone Energy, the most accurate March/April seasonal forecast came from Colorado State University (130 predicted vs. 129 observed), the most accurate May/June seasonal forecast came from the North American Multi-Model Ensemble (125 predicted vs. 129 observed), and the most accurate July/August seasonal forecast came from the Antigua Meteorological Service (93 predicted vs. 129 observed). The 2018 Atlantic hurricane season was extremely quiet in August and quite active in both September and October. The season will be remembered for two hurricanes. Hurricane Florence made landfall near Wrightsville Beach, North Carolina as a Category 1 hurricane and brought record-setting rainfall to the Carolinas as it slowed to a crawl and meandered across the southeastern United States for several days. Hurricane Michael made landfall near Mexico Beach, Florida as a Category 4 hurricane and brought extreme wind and surge damage to portions of the Florida Panhandle, with severe wind impacts also being felt inland in southern Georgia. A more in-depth discussion of the 2018 Atlantic hurricane season is available from Colorado State University.